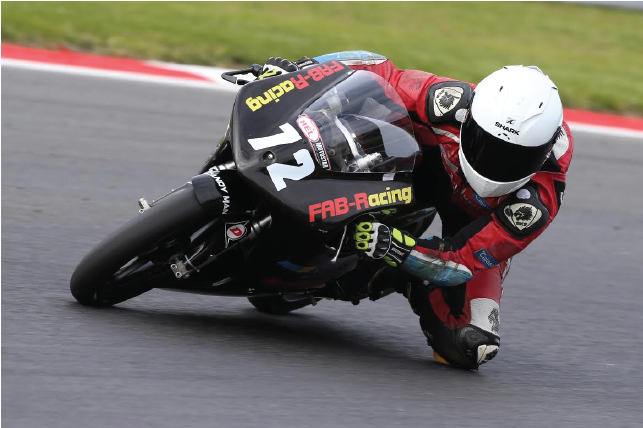 My name is Cameron Horsman and for the 2015 Season I will be riding with Fab Racing Race Team in the HEL British Motostar Championship on a GP125 within the British Superbike Series. I have been racing since I was 7 , starting out on a Mini Moto in 2009 with Fab Racing, in 2011 I came 2nd in the championship and started my 1st year on Mini GP50 , coming 5th overall. In 2012 I won my 1st Championship, becoming British Mini GP50 Champion at the age of 11. In 2013 I started racing Mini GP70 and won the championship , the season was really competitive and challenging but so much fun. 2014 was a really exciting year for me , moving on to the bigger tracks in NG Road Racing was a great opportunity to gain experience . I raced an 80cc against the 125cc’s and gave them a run for their money ! Racing with experienced riders on some of the best tracks in the country, against some fast bikes gave me some great experience to move into 2015 with . I will use this site to keep you all up to date with results, images and exciting news about what’s been happening and what’s coming up. I would like to take this opportunity to thank all of my supporters, my family and everyone who shows an interest in my progress, it’s an exciting time for me and all support is a huge help.